Photos published by V-Club members at events and meetings in the DFW Chapter. You must be logged into the members only section of the website in order to upload photos. Be sure to resize and compress your photo BEFORE you upload the photo to the online gallery. Your image should be no larger than 1280 pixels wide. 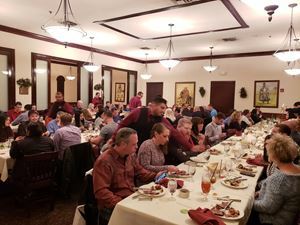 2018 DFW Chapter Holiday Banquet at Boi 'Na Braza Brazilian steakhouse - Over 90 attendees enjoyed some great food! 2010 CTS-V Sedan The Colony 2016 Veterans Day Car Show. 1st place 2010's car.